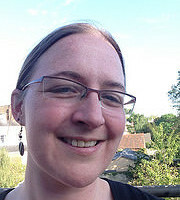 Janet McKnight has been a webmaster and web developer in HE for over 10 years, and has come to the conclusion that the only constants are change and insufficient documentation. She is currently Technical Lead for Web CMS Support at Oxford University’s IT Services; this involves looking after a wide range of sites and services built on Drupal, SiteManager, and other miscellaneous web technologies. Janet co-facilitated a workshop session on “All CMSs are Rubbish: Live With It!” from 16.00-17.30 on Monday 27 July 2015.